It’s December and I’m in Edison, watching Russell Duncan make paella in the back of Slough Foods. The pan is giant, a steel full moon, which I could easily curl up in and float across the slough if such a thing were possible. But it isn’t, so I watch him splash oil across the empty pan and let it heat to the perfect temperature. In Spain, where paella hails from (Valencia to be exact), the dish was cooked over open fires and under starry skies. It is a dish with deep roots, connecting back to the Moors who brought rice to cultivate in Spain in the 10th century. By the 18th, it was an established dish. It can take on a variety of flavors and be made with a host of different ingredients but its staples are round grain rice, vegetables, seafood, and meat. It is filling and delectable, adaptable yet always delicious, and an endlessly delightful dish to prepare…and watch being prepared! I turn back towards the cooking after spying a bald eagle in the wetland behind us. Russ throws the onion in. Sizzling, the aroma is comforting in the cold winter air. Next, a small mountain of garlic appears and then fragrant rosemary, which is deftly stripped off fresh sprigs and haphazardly thrown into the mix. Not without care, more with panache, a Swedish Chef kind of vibe. Paprika explodes in a cloud over it all and sinks into the oil, blooming a deep red. The pungent pepper hitting my nose as the breeze moves through. Russ takes out a spoon, it’s size and shape like that of the pan, and coaxes the ingredients together. A movement that seems more akin to painting than stirring, and which may be owed to the shape of the spoon, but is mesmerizing to watch nonetheless. 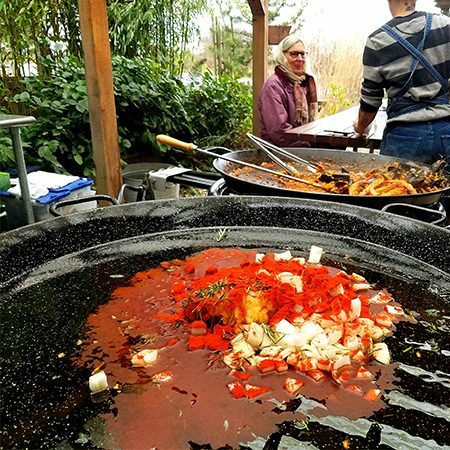 Over the sizzle of the ingredients you can hear wild birds chatter, and the owner and founder of Paellaworks, Knut Christiansen, talking. The entire endeavor started almost 20 years ago and that was after a long and storied career in the local culinary scene. Knut is definitely a Whatcom OG when it comes to food. He cut his teeth at Il Fiasco, a once upon a time well-loved Italian restaurant in Bellingham. Starting from the bottom and working his way up the line, he learned the nuts and bolts of what it meant to work professionally with food. 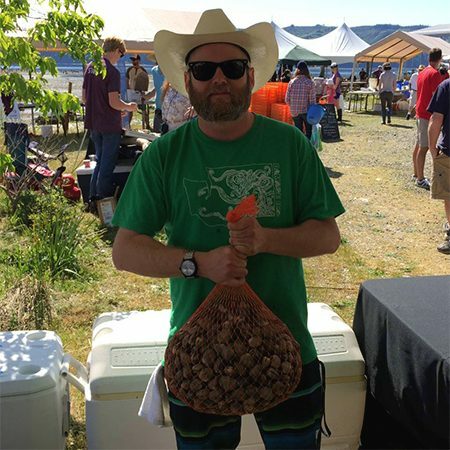 Later, he was involved with the budding microbrewery scene, helping get the first bites out the door for Orchard Street Brewery and then Boundary Bay. Fast forward through forays to Europe and Seattle, Knut returned to Whatcom and landed in Glacier where he eventually helped build and start the North Fork Brewery. Let’s stop for a moment and give silent thanks to Knut for what some say in the best slice in the County. When the time came to strike out on his next adventure, the perfect opportunity arose. 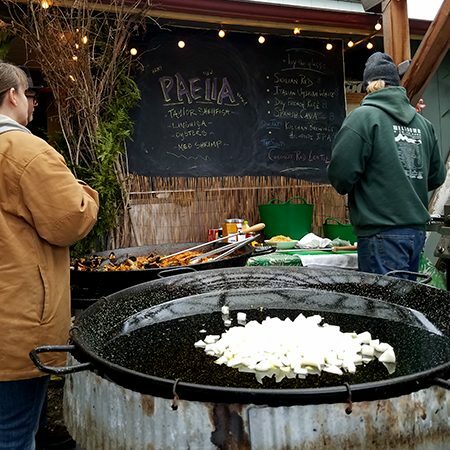 The then owner of Mount Baker Vineyards, whom Knut had worked for in the past, had bought some paella equipment and was looking for help with a new style of event catering. Knut could cook like a phenom, had run kitchens, and was no stranger to Mediterranean ingredients. The first few events were a success and in short, he found his stoke. 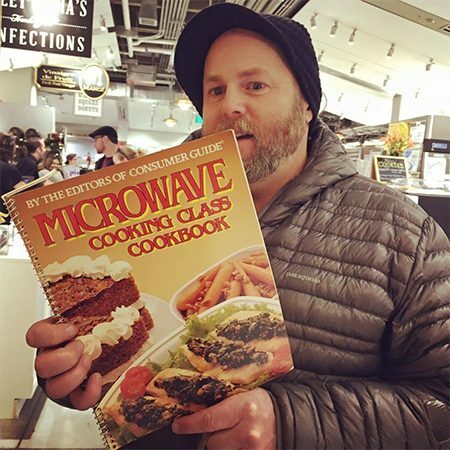 Working with cool folks at unique events, creating an interactive cooking experience, and paying homage to a cuisine that leant itself to PNW flavors was where it was at. 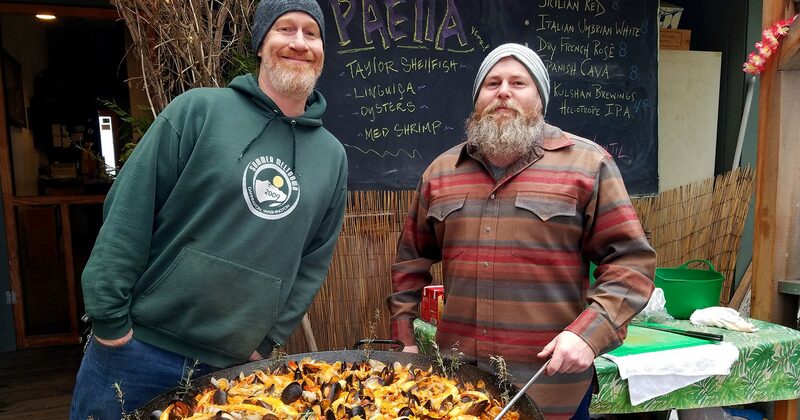 Paella became a vehicle to showcase our amazing local ingredients and give folks a way to take part in a dish from start to finish. They could watch oysters being shucked, ask about the farm the onions came from, and have “pan side seats” to the creation of a beautiful meal. I snap back to the moment, the aroma of the cooking paella right next to us is intoxicating! Looking over, Russ has finished creating a masterpiece (he is one of Knut’s main men, and can frequently be found cooking with Knut or at the Forrest Street Co-op where he also works!). It is bubbling, steaming, and making my mouth water. Today’s paella has shrimp, muscles, and host of fresh veggies. They source regularly from local businesses including the Community Food Co-op, Breadfarm, and Taylor Shellfish. During the growing season, they also source from Rabbit Fields Farm, Joe’s Gardens, and can be found perusing the Saturday Farmers Market. They are dedicated to making sure all their seafood is wild and sustainably sourced and the paella is made as traditionally as possible. Knut would call it an homage, a Pacific Northwest translation that honors the flavors of our region while also paying tribute to its deep Spanish roots and story. The wait was well worth it. 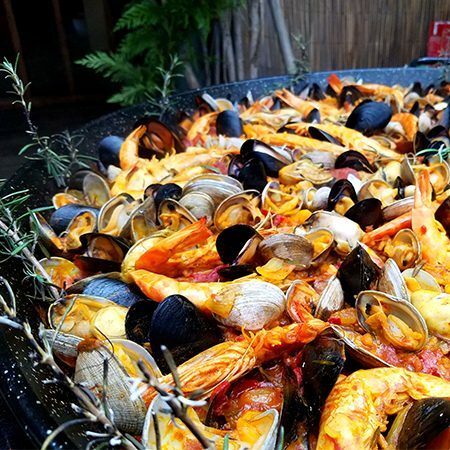 To spare another thousand words I’ll just say you should definitely try and experience Paellaworks for yourself. They are a popular caterer for weddings, corporate events, and any other occasions you might need delicious eats for. 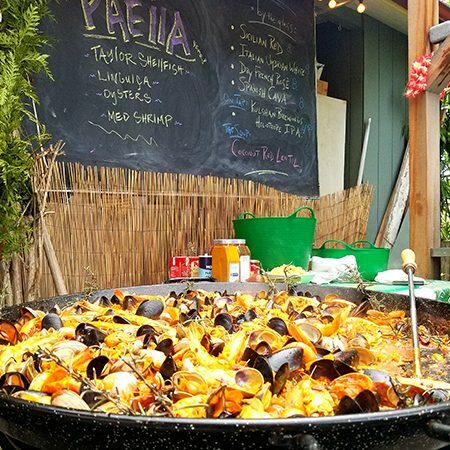 Their menus feature paella and arroz dishes as well as tapas, NW seafood beer boils, and bar packages. 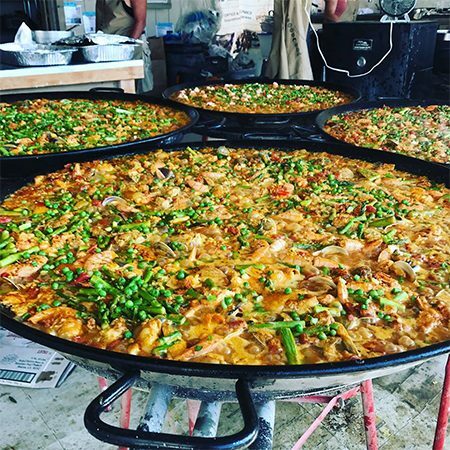 If you don’t have any events but would still like to try their amazing paella visit them at SeaFeast this September, or keep your eye’s on their Facebook page for upcoming Paella Parties at Slough Foods. Website photography courtesy of: Diane Padys Photography, Buff Black Photography, Katheryn Moran Photography, and Megan Gehring © 2019 Eat Local First. All Rights Reserved.